You will find a great selection of landscape supplies here at Whitney’s Farm Market. Whether you are a landscape contractor, or a do-it-yourself homeowner, we are your one stop shop for all of your landscape project supplies. This includes mulch, topsoil, compost, decorative stone, pavestone pavers an wall block, natural stone, and bagged products to match. 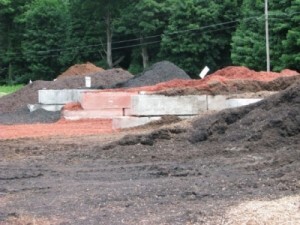 We offer delivery for all of our bulk yard products. Hours of operation are 8am-6pm throughout the growing season. At Whitney’s Farm Market & Garden Center you’ll find a great selection of bulk and bagged mulch and stone products. Whether you are a landscape contractor, or a do-it-yourself homeowner, Whitney’s Farm Market and Garden Center is your one stop shop for all of your landscape projects. 2 YD Minimum and Delivery Charge for each order for delivery. Loading 9-6 daily or call for delivery. FOREST MIX-NATURAL BROWN $42.00 YD. HEMLOCK-NAT. REDISH BROWN $55.00 YD. MIDNIGHT-AGED NAT. DARK $49.00 YD. PINE BARK – NATURAL BROWN CHIP $49.00 YD. BRICK RED-DYED RED CHIPS $49.00 YD. BLACK MAGIC-DYED BL CHIPS $49.00 YD. DARK WALNUT-DYED BR CHIPS $49.00 YD. PLAYGROUND CHIPS-GREAT FOR $45.00 YD. BERKSHIRE BLACK GOLD-DARK RICH ORGANIC LEAF COMPOST $65.00 YD. REGULAR COMPOST-COMPOSTED LEAF AND LIMB $45.00 YD. BLUE STONE 3/8″-NAT. BLUE COLOR $57.00 YD. BLUE STONE 3/4″- NAT. BLUE COLOR $57.00 YD. RIVER STONE 3/8″ – PEA STONE $57.00 YD. RIVER STONE 1/2″ $57.00 YD. RIVER STONE 3/4″ $57.00 YD. RIVERSTONE 1 1/2″ $57.00 YD. 1 1/2″ POND STONE $69.00 YD. 2″-3″ POND STONE $69.00 YD. 3″-4″ POND STONE $69.00 YD. WHITE LANDSCAPE STONE- 3/4″ $57.00 YD. RED LANDSCAPE STONE- 3/4″ $80.00 YD. BLUESTONE AIRPORT MIX $57.00 YD. WHITE BEACH SAND $46.00 YD. CRUSHED RED SLATE $79.00 YD. CRUSHED GREY SLATE $79.00 YD. 5 GALLON PAILS OF ANYTHING $4.00 EA. REG. SCREENED TOPSOIL- 100% $47.00 YD. PREMIUM TOPSOIL- COMPOST $55.00 YD.